Sunflowers. For some reason, we are drawn to them. 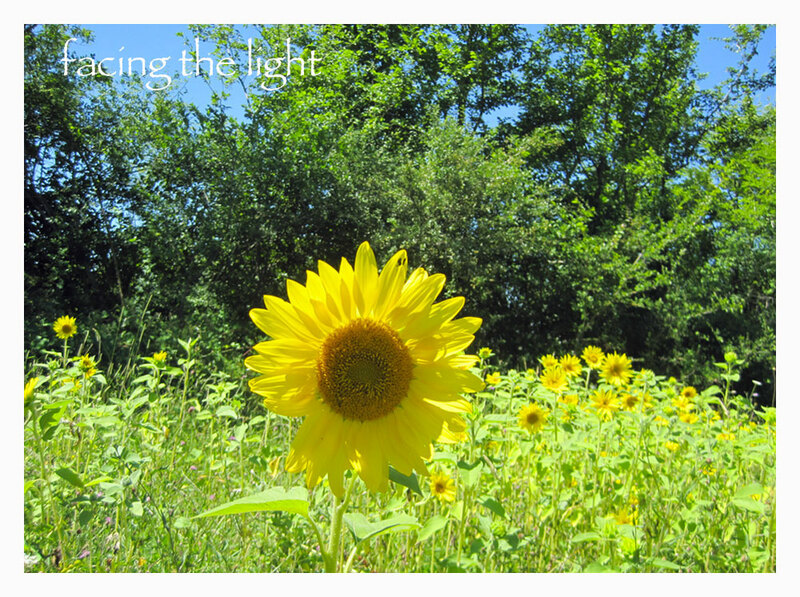 Again and again, sunflowers become part of our lives. We used them as inspiration and as the symbol a few years ago for our CD, Toward the Light, pondering how we turn instinctively toward nourishment and growth. So today, seeking the benefits of the sun’s replenishing warmth, we took a 3-hour hike into the mountains in search of ruins—old abandoned, mossy, ivy covered houses and structures, tucked into obscure places, that time seems to have forgotten. There’s something inspiring and soulful about ruins, so we seek them out. This morning we hiked up steep terrain. We followed dark green paths and squinted when we emerged from the woods into swaths of bright sunlight. We descended across shallow gorges and shuffled knee-deep through flowering meadows, finding surprises at every turn. Down an unmarked path that had been a country road in another lifetime, we stumbled upon a small but dazzling sunflower field. They were young flowers, not yet brown in the center. 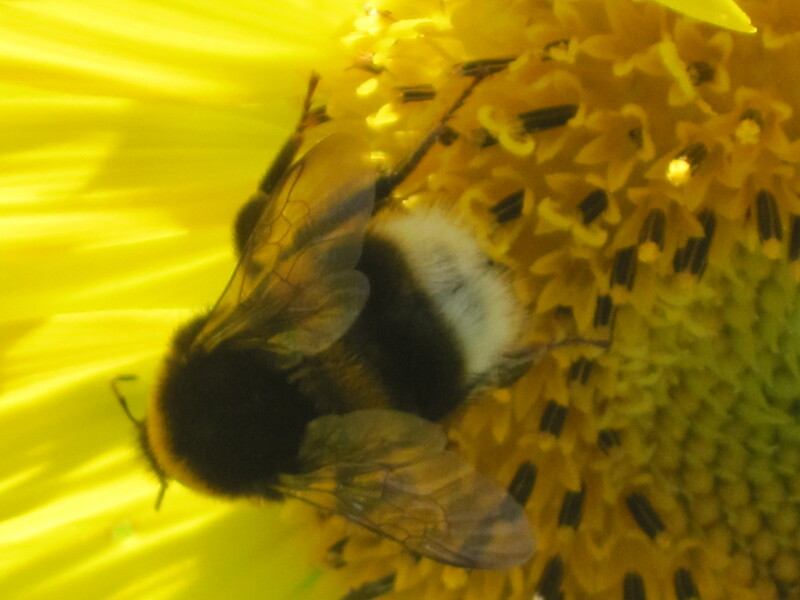 Bees buzzed amongst their faces, drinking nectar and ensuring next year’s crop. We took picture after picture as if they were long-lost relatives and this was our family reunion. It was a special moment that caught us off-guard and made the day more memorable. After several minutes, we returned to the marked path and began the climb up a stone-strewn slope. As the terrain leveled, we saw an unusual yellow and orange glimmer in the distance. 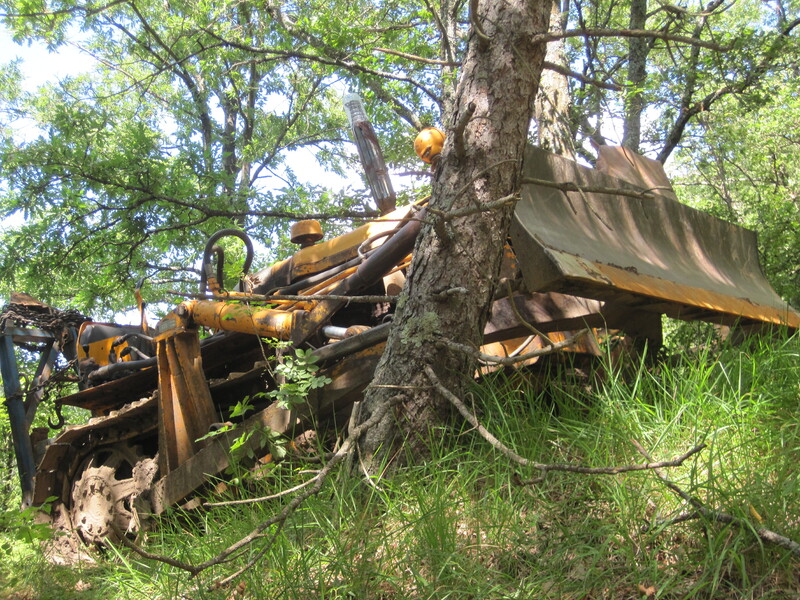 Drawing closer, we realized that our latest discovery was a rare find in such deep shade—a small colorful bulldozer, parked in a wooded thicket alongside the trail. Ahh, a sunflower in another form.